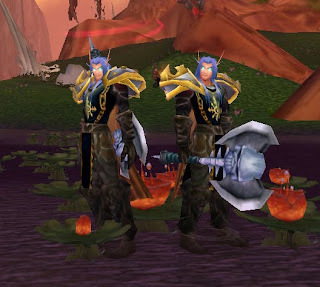 The words "Dualboxing Deathknights" make this scene pop into my head. It's not the most logical idea, melee classes don't lend themselves well to dualboxing due to positioning problems and follow breaking upon melee combat. Until recently I settled on the idea of simply playing one and /following on the other and just having that extra be useless dead weight. Combine with the fact that they're leveling in tank specs because I'm too cheap to buy them dualspecs and the fact that leveling multiple toons at once is slower than soloing they've been a total drag. Two days ago I fired up Keyclone just for the sake of making them talk in unison, because what's worse than creepy twin DKs? Creepy twin DKs saying the same thing at the same time. I decided to give playing them both at once with the help of Keyclone another shot. When I pull something with the leader character, the mob's hitbox is usually out of range of the follower character. The problem is I need to get follower into range of the mob in order to use him correctly, this would require me moving him into position for each pull, something that can become very tedious very quickly. It won't work. I realized my leader was in frost presence, not blood presence. He should regen health in blood presence as a blood DK so I shifted him. The other twin is frost specced, his icy touch and crap is improved. After pondering a moment I set him to frost presence--making him more threatening than his blood brother. I set up a macro to /assist [target=focus] /cast Death Grip and affixed it to my - key then shoved my 'follow focus' macro on my = key. I put empty macros on the leader's - and = key just so I had visual icons to remind me what is there. With this, my follower gets the mob, gets threat, and maintains it. My leader attacks the mob while standing well in the hitbox. I found that when Death Grip was down I could have both of them icy touch a mob and it'd usually land on the follower. It was really quite simple, I just had to put two and two together. Now I just have to refine the art. Nice. I like ur axe!